About Digital Rights Management: What is DRM Copy Protection in Digital Media Files? What is DRM (Digital Rights Management) Technology in Digital Media Files? 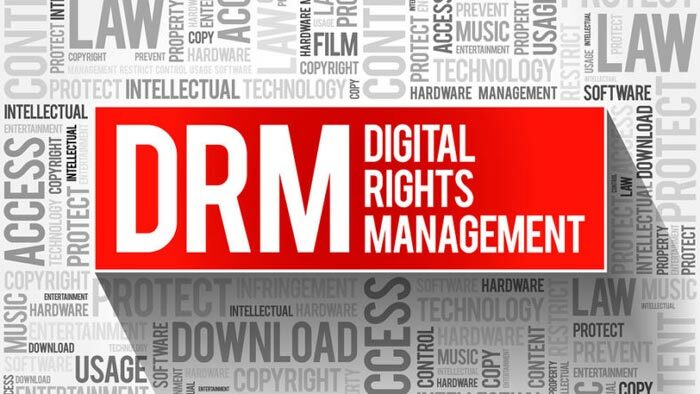 Get to know what is Digital Rights Management/DRM used in digital media files. DRM (short for Digital Rights Management) can be considered as an anti-piracy and remote control technology used by publishers, programmers, musicians and movie artists as digital copyright owners on how people install, listen to, watch and copy digital media files. Typically DRM is implemented by embedding code that prevents copying, specifies a time period in which the content can be accessed or limits the number of devices the media can be installed on. For digital content this means preventing the consumer access, denying the user the ability to copy the content or convert it to other formats. For devices this means restricting the consumers on what hardware can be used with the device or what software can be run on it. DRM always applies licensed encryption keys to prevent anyone from duplicating or using the file illegally. People who pay for these licensed encryption keys are given the unlock codes to use the file for themselves, but are usually prevented from then sharing that file with other people. DRM comes in many different forms in four common stages: packaging, distribution, license serving, and license acquisition. The use of digital rights management is not universally accepted. It is controversial and arguable because people may think they do not really own the file even buying it. Those opposed to DRM deem there is no proof that DRM can really help prevent copyright infringement, arguing instead that it serves only to inconvenience legitimate customers, and that DRM helps big business stifle innovation and competition. Furthermore, works can become permanently inaccessible if the DRM scheme changes or if the service is discontinued. Circumventing DRM may be illegal in and of itself, regardless of ownership of the IP (intellectual property) or intent after disabling the DRM method. However, according to the US laws itself, it is legal to rip a copy of copyrighted material for your own use under the concept of Fair Use. How to Know Whether an Audio Video Media File Has DRM Thereon? 8. In some instances, AAC files have DRM locks. Today's iOS devices are so self-supporting that purchased media can be downloaded and redownloaded without the bothers of DRMs purchased in iTunes earlier days anymore. Besides, there are softwares that remove or bypass DRM in audios, videos, DVDs, etc. For example, WinX DVD Ripper Platinum and WinX DVD Ripper for Mac are two DVD backup programs running on different platforms (Windows and Mac OS). The No.1 DVD ripping software which is capable of removing the most sophisticated Disney X-project DRM, let alone DVD CSS, region code, RCE and Sony ArccOS, UOPs. How to free convert and rip copy-protected DVD on Mac 2018-2019? WinX DVD Ripper Mac Free is the best answer. Learn how to from this tutorial. Part 1What is DRM (Digital Rights Management)? Part 2How to Know Whether an Audio Video Media File Has DRM Thereon?